The Gate Fire in San Diego’s East County became a criminal investigation Sunday afternoon, according to Cal Fire. Someone posted a video on Instagram of what appears to be a group of people starting the fire, according to Cal Fire Capt. Issac Sanchez. “The person who posted the video is cooperating with investigators and it has become a criminal investigation,” Sanchez told City News Service. 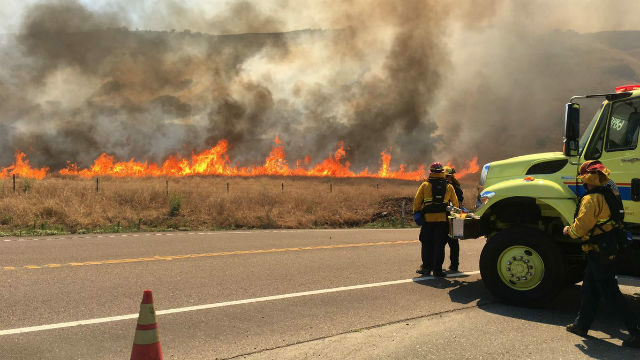 State Route 94 between Jamul and Dulzura was opened Sunday as firefighters continued for a second day to battle the fast-moving, 2,000 acre fire. The fire was 70 percent contained by the afternoon, Sanchez said. Dulzura remained in possible danger from the fire, and firefighters concentrated on structure protection of the historic hamlet. “Most of our resources are concentrated on the (east) area actively threatening Dulzura still,” Sanchez said. “It’s going to be a heavy ground resource attack. No structures were lost as of 6:30 a.m. Sunday. Otay Lakes Road remained closed from Wueste Road near Chula Vista, to Highway 94. But the state highway, also known as Campo Road, was reopened to traffic early in the afternoon. The National Weather Service in San Diego issued an advisory Sunday forecasting elevated fire weather conditions for most of the county except along the coast Wednesday and Thursday. The fire broke out at about 11:20 a.m. Saturday south of Highway 94, near the Border Patrol checkpoint east of Otay Lakes Road. Flames were first spotted on a dirt road called the Otay Truck Trail. It was primarily burning in grass and sparse brush on the flanks of Otay Mountain. That area is frequently used by target shooters, and it was apparently someone who was taking target practice that shot the video seen on Instagram. The historic settlements of Dulzura and Engineer Springs were under a voluntary evacuation for several dozen ranches. Residents who evacuated as the fire spread Saturday were escorted back to their homes, firefighters said. Firefighters from Los Angeles and Orange counties have joined local and federal firefighters from throughout San Diego County as a mutual aid to Cal Fire, the lead agency on the front lines. The fire was reported to be about 10 acres in size when firefighters arrived, but quickly grew at a “dangerous rate of speed,” Sanchez said. Hot, dry and windy conditions and rugged terrain helped the fire grow. The Thousand Trails Pio Pico Campground on Otay Lakes Road was evacuated, and there was damage to infrastructure at the campground, firefighters said. Most affected people were relocated to a Red Cross evacuation center at Otay Ranch High School in Chula Vista. Residents needing pet care were advised to contact the San Diego Humane Society. Smoke from the fire could be seen for miles. It was dubbed the “Gate Fire” because of its proximity to a landmark pink gate along the highway that leads to an access road, according to Sanchez. No firefighter injuries were reported, but a Chula Vista police officer was seriously injured while directing traffic at a street closure near Otay Lakes Saturday afternoon. There was no prediction as to when the fire would be extinguished.